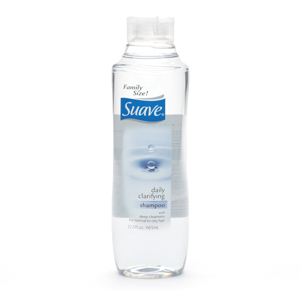 Suave Daily Clarifying Shampoo deep cleans and clarifies hair – for less than the more expensive brands. Penetrating lather completely removes the dulling build-up of hair sprays, mousses, gels, and over-conditioning, leaving hair refreshed and full of body. Deep cleaners eliminate the residue that can make hair dull and lifeless. Ph balanced formula is gentle enough for everyday use. Here’s my version: Dear Lord, I ask You to daily deep-clean my heart and clarify Your purpose for me this day. Penetrate completely into my inmost parts and remove the dulling build-up of sinful thoughts and desires; leave me refreshed and full of joy. Let Your Holy Spirit clean deep and eliminate the residue of this world that makes me dull and lifeless. Thank You for Your gentleness as You deal with me daily. Keep me balanced. Amen. Right there on my shampoo bottle. Who knew? I wonder if there are other labels out there that contain spiritual truths. It might be fun to look. She who has eyes to see, let them see. I love it! What a wonderful, creative way to view your shampoo bottle!! I’m going to have to go read my instruction labels a bit more carefully! Not sure how I ended up here, but I really, REALLY like your blog! Hi Brett! Thanks for stopping by! I’m a real novice at this, so your kind words are a real encouragement! Blessings!